If you’ve been riddled with curiosity wondering what became of my leftover fabric from my 1930’s blouse, I can now put you out of your misery. I bought two metres of fabric, and as I’m relatively petite, there was just enough left to cut out my mystery item …. a 1960’s A-line skirt from this pattern. I took a chance and didn’t make a muslin, I figured if it all went horribly wrong then this could be the muslin. After I sewed it up, I tried it on and had that rare, beautiful dressmaking moment - it was an exact, perfect fit. The only tiny adjustment I made was to take in half an inch at the widest part of the hips when I was sewing the side seams up and that’s it. In my experience, skirts are a lot easier than bodices to fit, but this was nothing short of miraculous. I underlined it with very thin off-white cotton (also from Ditto for £1.50 a metre). There wasn’t enough fabric for a waistband, so I drafted a facing from a piece of co-ordinating cotton. This sounds technical but in fact it was super easy to do and I got the method from this book – Sew What! Skirts. As well as showing you how to draft your own skirt patterns based on your own body measurements, it’s full of really useful advice on all things skirt-related. This is where I learnt to draft my own waistband for my Japanese pattern book skirt and that was a doddle too. I can’t recommend it highly enough. I liked the look of the facing so much I made some bias binding for the inside hem. Yes, nobody will see it, but I know it’s there. McCall’s 7978 is one of those patterns I’m sure I’ll use again and again. Reader Nathalie has a similar 1960’s skirt pattern and at the last count had made five versions! I'll definitely be following her example as it’s such an easy pattern to sew. There's more than enough time to embellish with secret hem bindings etc, without the whole project taking weeks on end. There’s also a fabulous, thrifty sense of satisfaction in using up leftover bits of fabric to create whole new garments. I’m now planning to make a plain red version with my leftover Swing Dress fabric and a grey floral version with my leftover Crepe dress fabric. If they’re as easy to sew as this little number, I can sew them up in time for Me-Made-June. Hoorah. Oh this is fabulous and funnily enough I've just been going through my vintage patterns, checking the pieces are all there, and this was one of them. I can feel it going to the top of the list!!! Great to hear your advice and I have that book too so that couldn't be easier. Love your little dotty touches! Jane This is stunning! You clever thing, that co ordinating fabric looks lush! Btw your necklace is AMAZING! This is just beautiful. I really am in love with the cut of the garment.It fits you so well. The color too is a favorite of mine. 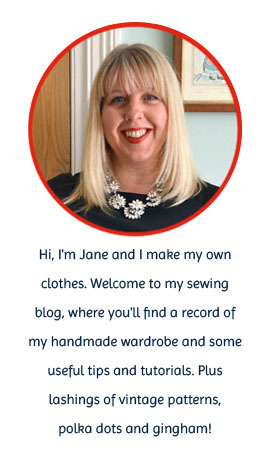 Great job Jane, look at you making your own hem binding, so pretty! Jane, this is lovely!! Love the detail on the hem too! excellent job! The style and the colour are just perfect on you Jane! I'm impressed at how easily it came together (skirts are definitely easier to fit than tops) and the book you recommend looks fantastic. As an aside, what a fabulous necklace you're wearing...love it!!! Beautiful colour and shape of skirt. I have the saw Sew What Skirts book too but have never used it - I really must peruse it! What a gorgeous colour, well done, looks great! I love the inside treatment - neat AND pretty. And hey, gorgeous necklace! Ooh, how lovely! I also love your treatment of the insides - the more I sew, the more I'm starting to love having nice neat innards to my clothes! And what a stroke of luck with the sizing - huzzah for patterns that don't need fiddling with! Very nice, I have a whole stash of leftover fabric I need to use. Hope fully my projects will turn out just as well as your skirt! Very Cute! I love your attention to detail! I love a finished, professional looking garment! I should really start sewing separates! They are so versatile! Hi Jane. Another doozy! Fab colour and lovely style. I'm really digging A-line skirts at the moment. Never thought I would hear myself say that. I do like garment thats as good on the inside as out! So special. But what came first? The necklace or the skirt?! Yey for bias tape...I love both of the fabrics you have used here, and the finished skirt looks fantastic! This looks so nice, inside and out. I am so impressed at your attention to detail in making a "free" garment. It would have been so easy to rush at it because it was in a way "disposable", instead of doing as you did, and valuing the materials as if they had been bought with this item in mind. Love the dots! And the necklace is the perfect finishing touch to your outfit! Gorgeous colour and beautiful fit! I didn't line any of mine, but am already planning the next batch and will definitely be considering it as yours looks fabulous. I also love such details, even if I'm the only one to ever see them. Is the outside waistband the same cut and fabric as the inside? I've been working from McCall 6439 which I thoroughly recommend (although other views of yours are more interesting than mine. Mine starts off simple and only goes into increasingly gored views with no detailing...). Gorgeous finish on the inside Jane,and that necklace is a bit yummy! That looks as nice inside as it does out - I dream of that one day! This skirt is lovely. The facing and binding are really beautiful, the type of details I love!